A chip in your windshield can be a small blemish you hardly notice. However, small chips or cracks that are not repaired can quickly turn into a bigger problem. At the Auto Glass Warehouse, we offer quick and easy mobile auto glass repair to your home or work that can help prevent extensive damage and extend the life of your windshield. While driving along the road, small pieces of rocks and gravel can be kicked up onto your windshield and create a chip or ding where a piece of glass comes off the windshield. 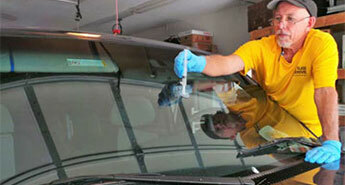 Once you notice a chip in your windshield, place a call for an auto glass repair as soon as possible. If left unattended, even for a few days, tiny chips and cracks can quickly spread across your windshield due to things such as extreme temperature changes or a bumpy road. Windshield chips, if they meet certain conditions, can be repaired quickly by a certified auto glass repair technician. Our technicians repair your windshield by applying a specialized type of resin that fills and seals the chip, reducing the visibility of the damage. It is very important to always make sure to only use highly trained and certified technicians, as a windshield repair cannot be redone once the resin has cured. If the damage matches these requirements, your windshield may be eligible for a repair! Attempting to do a auto glass repair on a windshield that does not meet these requirements is unsafe. A crack larger than a 1/2 inch would compromise the strength of the windshield and place you as well as your passengers at a higher risk of injury in the event of a car accident. Your windshield provides more than 40% of the structural integrity of your windshield during a accident. It also allows for proper deployment of the passenger airbag. Therefore, the windshield is of the utmost importance to a vehicle occupant’s safety. A repair that does not meet our repair requirements would cause the windshield to have far less integrity during accidents and when encountering debris and weather. Our staff is dedicated to the safety of all our customers and their family. We want to make sure your vehicle is as safe as possible on the road. We therefore will visually verify that your windshield damage meets these requirements before moving forward with any auto glass repair. If you are unsure if your autoglass damage meets these requirements, our knowledgeable staff will be glad to assist you in the determination. Our technicians will also verify the damage is repairable upon arrival onsite. 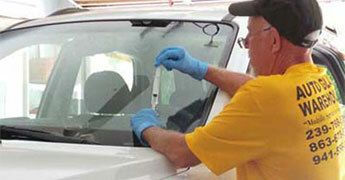 Be sure to have any questions you may have about your windshield repair answered by our skilled technicians. They will be glad to give you any information you need.